Final program is now online! The Swiss Geoscience Master Congress aims to offer a platform for Master students (and prospective students) to present their research among other students in a conference like setting. The fourth edition of the Master Congress is held in Bern, organized by Master students of the Institute of Geological Sciences in Bern. We would like to thank you so far for your registration and to the contributions of abstracts! We are glad to inform you, that more than 80 people registered for the meeting. Prof. Dr. Heike Mayer: She’s Professor of Geography at the University of Bern and Member of the Center for Regional Economic Development (CRED) at the University of Bern. She studied at the University of Konstanz (Germany) and in the Portland State University (USA), which allows her to give insights into different educational levels. She will tell us, how she experienced her academic career and on what we should focus by starting an academic career. Dr. Alex Hoffmann: Recently hired by the ESA – hence still close to the student community, studied at EPFL and got his PhD from the University of Cambridge (UK) in Earth Sciences and Meteorology. He will share with us his own experience of working for the ESA. Please find no the finalized program online. Registration is closed since 1st November 2018. Due to space limitation, we are not able, to accept further registrations or abstract submissions. Furthermore, on-site registration will no longer be possible. Thank you for your comprehension. 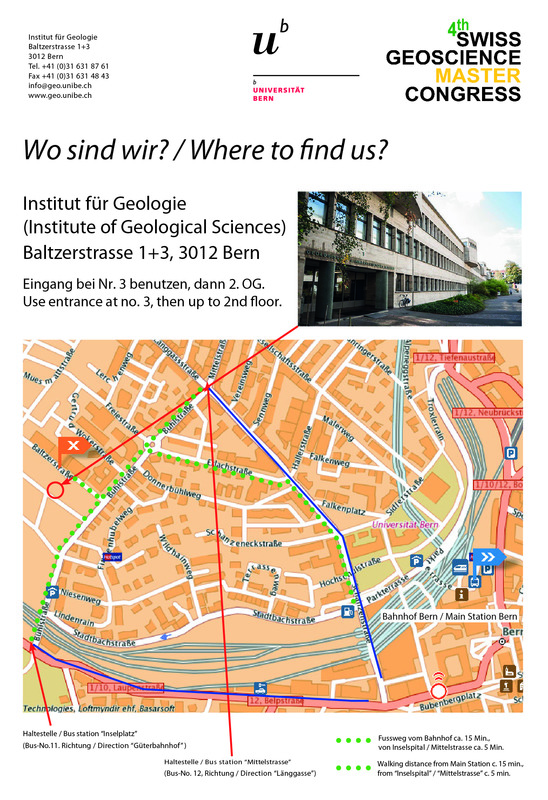 Where: The event will take place at the Institute of Geological Sciences, Baltzerstrasse 1+3 ,CH-3012 Bern Switzerland. Rooms will be signposted. Please also check the situation plan. When: Thursday, 29 November 2018, registration desk open from 09.00 a.m.
Talks should not exceed 15 minutes (12 min plus 3 min discussion). Provide your presentation in a powerpoint-file or as a pdf. Both, PC- and Mac-Systems are available, however, we ask you to prepare your presentation Mac-System compatible. Please do not bring your personal PC/Mac for the presentations. Beamer-format is 16:9, please prepare your presentation accordingly. There is no microphone available. Presentations for the morning session & afternoon session can be uploaded prior to the meeting from 09.00 a.m. on. Presentations for the afternoon session can also be uploaded during the lunch break. Posters should be size A0, portrait-format. Poster-print is not provided; bring your own poster. We provide taks to hang up your poster. You can hang up your poster prior to the meeting from 09.00 a.m. on. Poster presentations will be during the coffee-breaks and lunch-break. Note: There will be no official print-out booklet of the abstracts, please find the program & abstract booklet here. The Swiss Geoscience Master Congress 2018 is grateful to the help and support of the following institutions. Without them, this event would not be possible to this extent.